last month, mike and i were fortunate to attend the wedding of a wonderful couple – one of those couples you really support and enjoy sharing in their wedding day, because they so complement one another and the healthiness and honesty of their relationship is just obvious. we really wanted to give them a heartfelt gift, and i wanted to give them something crafty; she is actually a large part in me getting back into something i absolutely love – pottery. i was in a funk, not very much enjoying life in my little apartment in a bad neighborhood in cleveland, when she recommended a ceramics class at arthouse. i won’t say it was like riding a bike, as my first few pieces were definitely of the quality only a mother could love, but it has been absolutely energizing and has brought a lot of happiness and passion for the past year or so. i love the way the clay feels between my hands, spinning on the wheel. i love experimenting with different shapes, different glazes, and seeing the progress from week to week as my pieces become larger, more intentional, and even matched, as part of sets. i even grew to love the little arthouse family: the “lifer” who had been taking classes there for more than 10 years and is obviously in desperate need of adult socialization (she works at a daycare, and in the rest of her time cares for her mother, who is in the late stages of Alzheimer’s); Goldie, a fabulously carefree 80- or 90-something year-old crochet master, who couldn’t throw a pot if it saved her life but sure had a hell of a good time trying; and a 13-year old emo-punk teenager who displayed some of the sweetest, best manners i have ever seen from a teenager while crafting neon pink and turquoise pieces decorated with snakes, skulls, and crossbones. in any case, i figured i owed it to jennie to make her something as a sort of thank you for getting me back into something i love so much. however, my skills on the wheel aren’t that strong, so i didn’t feel any of my pottery was high enough quality to give as a wedding gift. 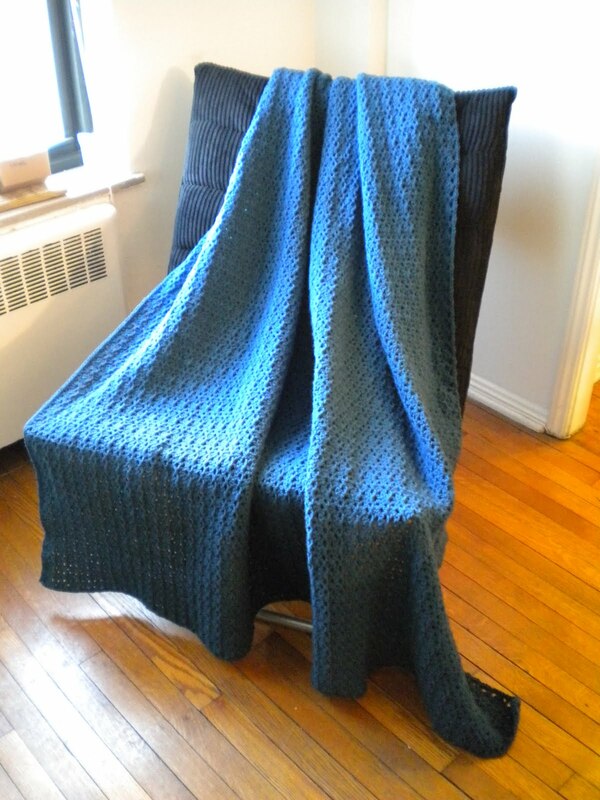 so, i crocheted this oversized, soft afghan (matched to the decor of their living room) for them (and threw in a gift card for good measure). i am thrilled with how it turned out! jennie tells me their cat, mouse, has claimed it as her own; sure enough, when we went to their place after an indians game last friday, there was mouse, all cozy on the afghan. here are a couple of photos of the finished product. 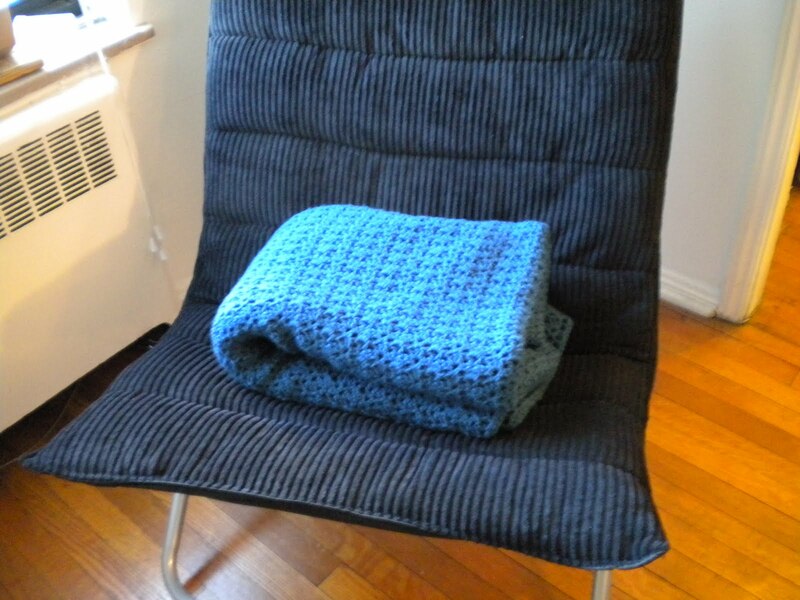 This entry was posted in Crochet and tagged afghan, crochet, wedding gift. Bookmark the permalink.